Flagstaff's lift-system is one of the easiest to operate and maintain of any pop-up camper. In fact, the lift-system can operate for years without any maintenance at all. However, lift-systems have parts and--even though salespeople don't like to admit it--parts can wear down or break. Here are some tips to keep the camper popping up and down for years to come. First check for any obstructions including an unlatched roof latch or gear loaded on a roof rack (all items stored on a roof rack should be removed before raising a pop-up roof). If that's not the issue it's possible the lift system needs a tune-up. Locate the weep holes on the lifter conduit at each corner of the camper (under the camper). Use a piece of plumber's putty, strip caulking, chewed bubble gum and duct tape, etc. to plug the hole temporarily so the oil can saturate the push-spring and not just drip back out of the hole. Remember to remove this plug after a few hours. A small amount of oil will still be able to drip from the weep hole so have some cardboard or a drip pan handy. On the winch: spray lubricant (like WD-40) around the winch's main bushing and the main drum (where the cable spools). Be careful to avoid the leather disc--this enables the winch to hold the roof in position when you stop cranking and needs to be dry to work. On the winch: remove the lower pan (the cover that prevents mud and road junk from hitting the winch) and spray lubricant (like WD-40) around the main drum (where the cable spools). Step 5 (not usually necessary but good to know): paraffin wax (available at grocery stores in the canning section) can be rubbed on the lifter arms if the lifter arm sticks when the roof is lowered. Another cause of the roof sticking is the camper not being level. Make sure the camper is level and see if the lifter arm still sticks during tear-down before attempting the tedious task of waxing the lifter arms. This is probably due to a not-level-enough camper. If the camper is leaning to one side or the other the roof puts extra pressure on that side's lifter arms. The extra pressure creates friction which may be sufficient to hold the roof up even when you crank down the lift-system. Slow solution: crank the roof up and level the camper better. Try cranking down the roof again. Fast solution: push on the lifter arm (as close to the roof as you can reach without losing your leverage) away from the direction the roof is leaning. This will take the pressure off the lifter arm. If the lift-system is cranked down (there is slack on the lift system when the roof hung up on the lifter arm) when you try this the roof could fall rapidly and pinch you fingers in the lifter arm sections or hit someone in the head with the falling roof! We recommend trying this method only if the roof has been cranked down a foot or so to limit the falling action of the roof. If you didn't notice the lifter arms hanging up until the other side is down much further, crank the roof back up until the loose side is only a foot or so below the stuck side. The square winch socket the crank slides into is replaceable. It can also be repaired by hammering the socket back into it's original square shape (but this generally requires more labor than what the new socket costs). April 2015: The following section refers to Carefree of Colorado's older power winch, model P55000. Flagstaff now uses Carefree's model P55012 for campers with a powered lift-system. Make sure the battery has power. 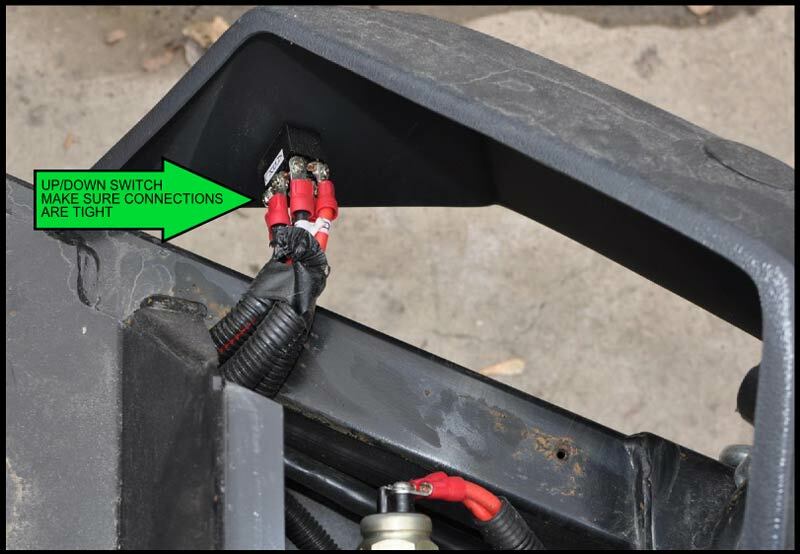 Make sure the thick red wire coming from the powered lift-system is connected to the battery's positive terminal; make sure the thick black wire is connected to the battery's negative terminal. Check that the switch connections are tight. Remove the lower pan/cover from the tongue (the pan is held by four screws with a 3/8" hex head). Locate the big wad of electrical tape where several wires come together. 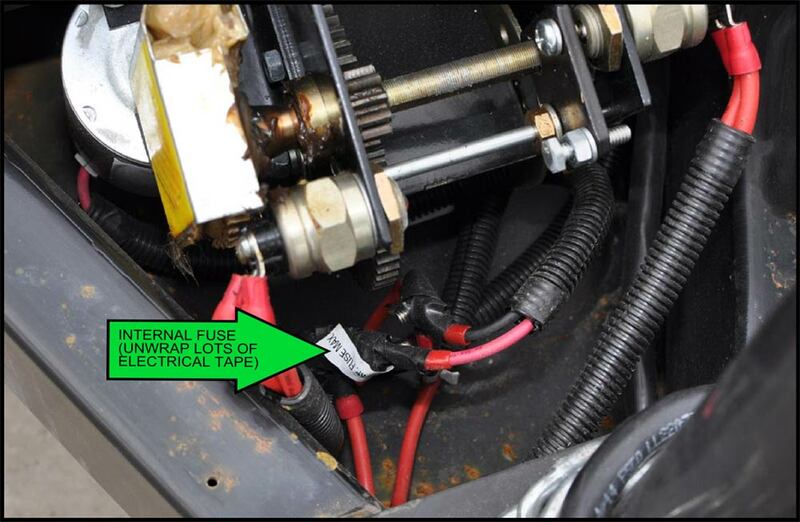 Unwrap that big wad of electrical tape to reveal the large-amp fuse (50 or 60AMP, depending on the model year). 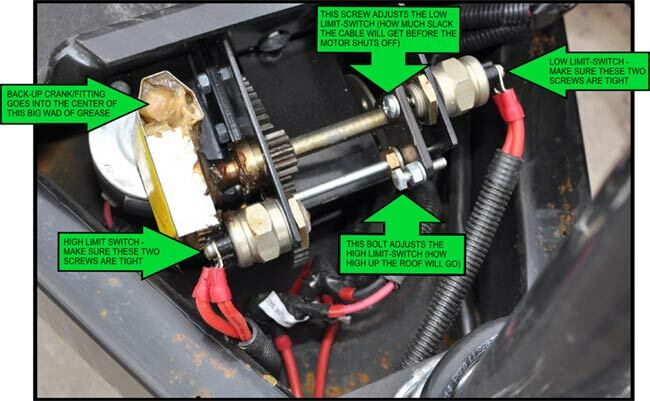 The fuse connects to the wires by nut and bolt--use wrenches or nutdrivers to remove/replace the fuse (keep track of which wires attached to which end of the fuse). If this does not cure the problem check that the limit-switches are functional (as described in the next section ). If the limit switches are functional it's possible the motor is a goner. The powered winch has limit switches on the high end and the low end to make sure the winch doesn't crank the cable up or down too far. 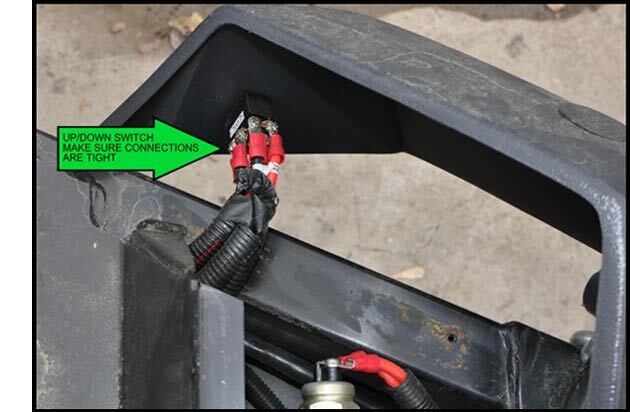 Ideally the limit switch will be set by the dealer before you receive the camper but even so, over time, the cable can stretch slightly or the cable can spool on the winch drum in such a way that the limit switch becomes an issue. Remove the cover (black plastic cowling) from the top of the lift-system area. The cover has the switch attached to it so you can only move the cover off to the side as far as the wires will reach. The bolt has a lock nut that needs to be loosened before the bolt can be moved in or out, depending on whether the roof needs to go higher or lower before stopping. This is a trial-and-error affair--be patient and eventually the roof will stop exactly where you want it to (typically when the height-indicator cable becomes taut). Move the low-limit screw in or out, depending on when you want the winch to stop cranking down. Ideally the winch would stop after giving plenty of slack on the lift cable such that the roof can be pushed down and latched without tension/pressure from the lift cable. NOTE: the wires connecting the limit switch assemblies to the system can jiggle loose over time. Use a Phillips screwdriver to tighten the connections. Hook up your tow vehicle's battery to the camper's battery with jumper cables (or hook-up your wire loom if you have a charging circuit). Let the car battery do the lifting until the camper's battery is able to be recharged. Pop the round plastic plug from the black plastic cowling (the cover the switch is attached to). Under the plug is a big wad of grease (see picture in previous section ). In the middle of the wad of grease is a bolt head that runs the worm drive to lift the roof manually. The power-lift system is geared such that a relatively modest electric motor can lift a 200-300lb. camper roof. This is perfect for a fast-spinning motor; this is a nightmare for a person using a hand crank. It takes roughly 2000 turns with the back-up crank to lift the camper roof by hand! So, while the electric motor can raise the roof in roughly 30 seconds it would take most of us ~30 hours to raise the roof by hand. The MUCH better solution involves using a cordless drill and a socket that will do the cranking for you. In fact, the first thing we would do with our own powered lift-system back-up crank is chop off the handle in a band saw and keep the end for use in a cordless drill. Can I exchange my manual winch for a powered one? Can I exchange my powered winch for a manual one? The preceding information regards the current Flagstaff lift system. For the chain-drive system used from 1988 to 199(5?) please call us at 303-922-6221.